The Rev. William Brauner addresses a crowd at Temple's town hall on the proposed football stadium after protesters disrupted the campus event on Tuesday, March 6, 2018. Temple University's public town hall to discuss a proposed football stadium in North Philadelphia lasted all of 10 minutes. 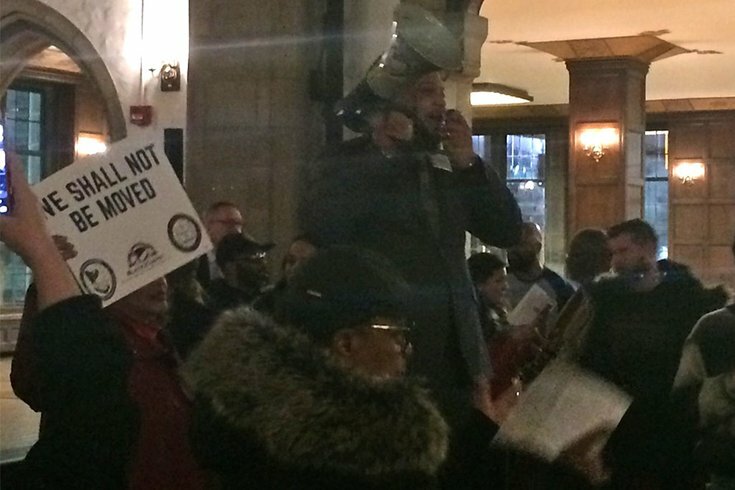 The university's first public meeting on the $130 million project unraveled Tuesday night as determined protesters shouted down university president Richard Englert at the campus event. Community members interrupted Englert's introductory remarks on the proposal, first from a megaphone outside Mitten Hall and then from inside the event. A moderator's attempt to pause and reconvene the meeting ultimately failed. By all indications, that was the protesters' intent. Temple officials last week declined an invitation to attend the community's own public meeting at G.W. Carver High School of Engineering & Science. "This community has a very good reason to be rowdy and yell about this," said Phil Gregory, a member of the local opposition group Stadium Stompers, on Tuesday night. "Temple University isn't just these buildings. It isn't just President Englert and all of these nice new things they're trying to put up here. Temple University, this area, is the North Philadelphia community. It is the people here who have been pushed out, murdered, their homes burned down or bought out from under them. It's really important that we focus on that — and the fact Temple left this meeting because they're not invested in that story." The outcome of the town hall, based on two years of organized opposition to the stadium, was as foreseeable as it was emblematic of the distrust that surrounds the university's plans. Englert's opening comments covered Temple's motivation to build the 35,000-seat stadium, the university's current community engagement initiatives and his vision for how Temple becomes a better neighbor across the board. 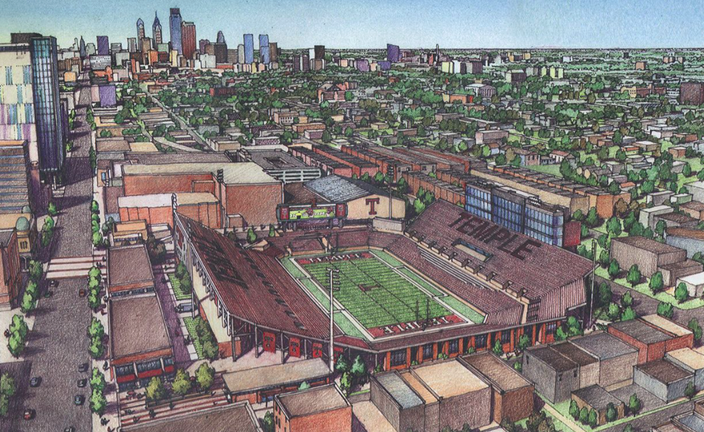 Rendering of proposed football stadium at Temple University's North Philadelphia campus. He claimed that the stadium, proposed at a site bounded by Broad Street west to 16th Street and Norris Street south to Montgomery Avenue, would not displace any North Philadelphia residents from their homes and would be built with minimal environmental impact on the surrounding neighborhood. Other facets of the project would include classroom and event space, research facilities and workforce development initiatives for North Philadelphia residents. "The multipurpose facility — if done right — can have benefits to both the community and the university," Englert said. "Our goal is to work with residents to understand how we can ensure there is value to all." 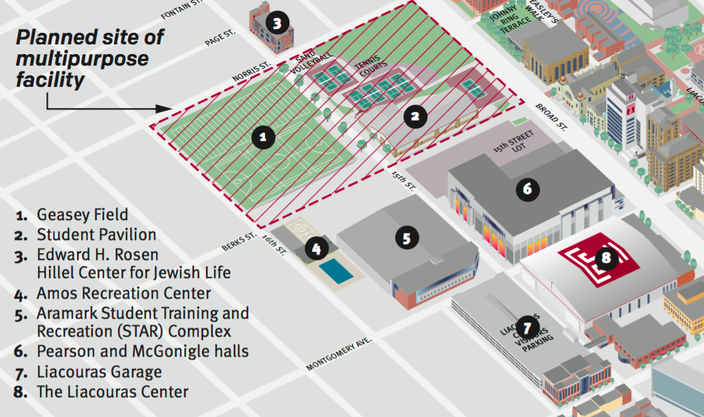 Map of proposed football stadium at Temple University's North Philadelphia campus. Ultimately, Englert was overpowered by protesters during his discussion of a proposed Special Services District (SSD) to encompass the stadium site. Run by a community board with funding from Temple and its partners, the SSD would receive additional maintenance and law enforcement resources from the city at no cost to local taxpayers, Englert claimed. "That's a damn lie!" one protester shouted. "Put it up by your house!" said another. And then the town hall, originally promoted as a discussion of the stadium's structural aspects, descended into chaos. An audience of more than 100 people, many for and many others against the stadium, appeared both unsurprised by the protest and uncertain about what will come next. "Down with the stadium! Up with the community!" the protesters repeated. Temple police Chief Charles Leone said there were no arrests and no one was removed from the event, adding that the primary goal was to ensure safety and give people a chance to speak freely. "We knew going into this that it's a very sensitive topic," Leone said. "We want our neighbors to have an opportunity to speak. From our standpoint, we wanted to make sure we didn't have it so layered that it looked there was a big police presence here to stifle anyone." For Englert and the Temple administration, an event designed to reassure the community with details about their proposal came apart because of a fundamental misunderstanding of the opposition. "You can't expect people not to be upset," said Rev. William Brauner, who delivered an impassioned speech on his megaphone after the meeting ended. "Hear from the people who are upset. Listen to their stories. We have given Temple an opportunity for our voices to be heard. They wouldn't listen. "We're angry," he continued. "Don't we have a right to be angry? We're worried about where we're going to live, how we're going to live, if the stadium gets built. They're worried about a football game and we're worried about our lives."